If you do not worship elsewhere, we hope you will join us. Each of our four Sunday morning services focuses on a unique "musical heart language" - traditional, blended, or contemporary. Traditional Worship service | 8:30 a.m. in the Chapel. Worship includes piano and pipe-organ accompaniment, congregational hymns, and choral anthems. Worship is led by our Traditional Worship Arts Pastor, followed by teaching from our Lead Pastor. The services last about an hour. 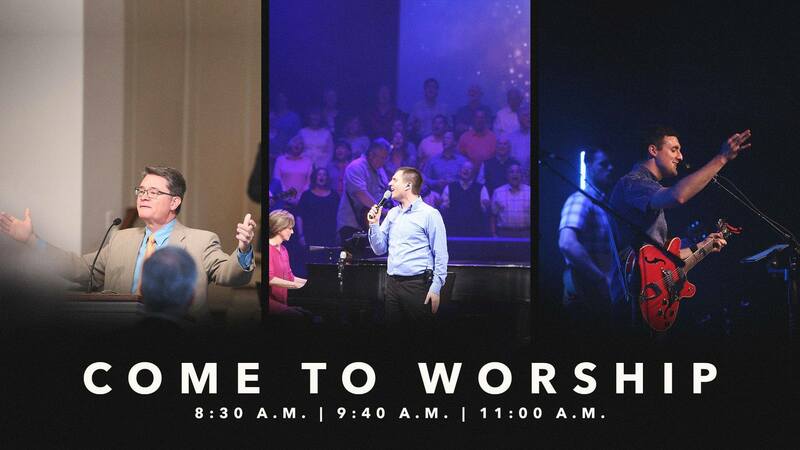 Blended Worship service | 9:40 and 11:00 a.m. in the Worship Center. Each service is identical and includes band and orchestra accompaniment, choir and vocal team, modern worship songs as well as fresh arrangements of old songs, and other creative elements. Worship is led by our Worship Arts Pastor, followed by teaching from our Lead Pastor. The services last about an hour. Contemporary Worship service | 11:00 a.m. in the Multi-Purpose Gym. Worship is led by our Contemporary Worship Arts Pastor, followed by teaching from our Lead Pastor, most often by video. This service is guitar-led, and band-driven, with a lead vocalist or two. The song choices are more contemporary. The services last about an hour. Midweek Worship service | 6:30 p.m. in the Chapel. Our Midweek service is led by our worship leadership team, followed by in-depth Bible preaching and teaching by our pastoral leadership team, as well as corporate prayer for congregational needs and mission teams. The services last about an hour.